Unlike the author of the latest biography about the physicist, Paul Dirac, I actually had dinner with Professor Dirac, and his wife, in 1975. This fortunate event was a consequence of my being the student of the late Professor Christie Eliezer, who was himself one of Dirac’s few research students in 1940s Cambridge. Eliezer had already exposed me to innumerable “Dirac stories” so, I was not particularly interested in re-reading them in book form. That kind of reflexive myopia may well have been anticipated by both the publisher and the author—himself a former theoretical physicist. Between them, they seem to have planted a multitude of hooks designed to catch the least curious reader. 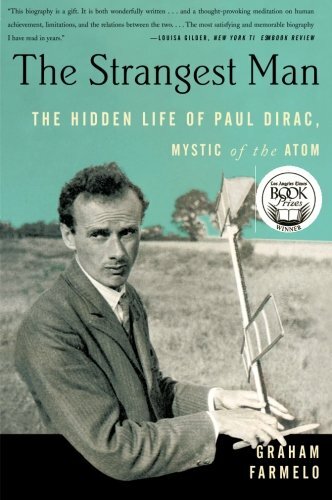 For me, it started on the Web, where I first saw the previously unpublished photo of Dirac on the book’s front jacket. What is the young Dirac holding? Since I already knew that he was originally trained as an electrical engineer, I assumed that it might be a newfangled antenna being developed as part of the British war effort on radar. It’s not! But to find that out required that I already have a copy of the book in my hands. By then, I was hooked. Starting on page one, the entire text is strewn with even more intriguing hooks. The book opens with a glass of orange juice spiked with hydrochloric acid—a chemistry experiment being performed by Dirac, on Dirac. The conclusion of the experiment was that Dirac had suffered from a stomach ailment for the preceding eighty years of his life and the compensating acidity of the spiked juice proved it. Why was this a revelation to me? My aforementioned dinner with Dirac occurred when he was only seventy-three years old. As the book title suggests, not only did I experience Dirac’s devastatingly strange social persona, the encounter over a meal may well have been exacerbated by his digestive problems that neither of us knew about. The hallmark of this biography is its visuals: both photographic and textual. As evidenced by the book jacket, Farmelo clearly had access to many previously unpublished photos of Dirac, his family, friends, and colleagues. Beyond these new photos is Farmelo’s vivid and sympathetic textual portrait of Dirac the person, not just the physicist. As the author notes, Dirac claimed that he made many of his mathematical advances via geometrical visualization rather than through clinical algebraic manipulation. Compared with Richard Feynman, for whom Dirac was a hero, no evidence of such visuals can be seen in Dirac’s academic publications. Curiously, however, I do recall a striking piece of imagery employed by Dirac in his one and only lay publication in Scientific American, where he describes the time it takes light to cross a proton. This aspect of Dirac’s mind remains a paradox that even Farmelo does not manage to penetrate. There is plenty of pathos in the peculiarities. In 1937, Dirac married Margit Balázs (née Wigner); known affectionately as Manci. As Farmelo tells us, and I witnessed in 1975, she held court in social settings and otherwise protected Dirac. With reference to the robustness of their forty-seven years of marriage, Farmelo quotes the poignant observation that while Dirac gave Manci status, she gave him a life. Throughout, Farmelo describes other poignant events in Dirac’s life, such as the apparently spiteful removal of his parking privileges at Cambridge, long before his formal retirement in 1969. In 1971, the Diracs moved to Tallahassee, Florida. Despite the fact that Dirac was a major historical icon of physics, it was not a slam-dunk that an “old man” be offered a Visiting Professor position in the physics department at Florida State University; then ranked eighty-third in the USA. Dirac put FSU on the map. At a deeper level, Dirac was ultimately disappointed with himself for not solving quantum electrodynamics, which he regarded as profoundly flawed. We are left wondering if, as Lucasian Professor, this judgment arose out of Dirac comparing himself unfavorably to Newton’s more permanent success. Beyond acknowledging similarities between the lonely childhoods of Newton and Dirac, Farmelo doesn’t speculate. However, Farmelo is compelled to speculate that Dirac had all the characteristics associated with high-functioning autism. I’m not a psychologist or neuroscientist, nor is the author. In my view, Farmelo is over-reaching here and although I find his speculation interesting, it is not convincing. It reminds me of the unproductive ploy of keeping Einstein’s brain in a bottle and dissecting it to find out what made Einstein, Einstein. After fifty years, we are still clueless. Even if Farmelo is correct about Dirac, he overlooks the possibility that physics is self-selective for a spectrum of autistic-like traits. Was Pauli autistic? Was Bohr autistic? Was Einstein autistic? Farmelo doesn’t explore these comparisons. On the other hand, Farmelo does tell us how Dirac’s contemporaries reacted to his personality. Bohr’s assessment provides Farmelo with his book’s title. Einstein pronounced Dirac to be walking a fine line between genius and insanity. And what about Felix, Dirac’s older brother who committed suicide? Was he also autistic? Farmelo tells us that their relationship finally broke down to the point where they passed each other in the street without speaking during the period when they were both engineering trainees in the west midlands town of Rugby. Very odd and sad, but was that due to autism or was it just a filial falling out? These questions are never addressed. We do learn that Dirac consistently laid the blame for many of his social inadequacies squarely at the feet of his domineering and severe father. In support of his autism interpretation, Farmelo points to Dirac’s later verbal accounts of his dysfunctional childhood as being inconsistent with the fact that there is no mention of such dysfunction in family letters. On the contrary, I see this as quite consistent because written accounts have a habit of becoming treacherous. Farmelo also overlooks the possibility of Dirac tending to play up his taciturn nature with typical British eccentricity. Like Einstein, who, until the end of his life continued to toil at unifying his classical gravitational and electromagnetic fields, Dirac tried to find a more mathematically consistent theory for his quantum fields. In particular, he expressed discontent about the accepted convention of removing various quantum field-theoretic infinities through a procedure called renormalization. “Sensible mathematics,” Dirac said, “involves neglecting a quantity when it is small, not neglecting it just because it is infinitely great and you don’t want it!” In this way, both Einstein and Dirac came to be viewed by many of their younger contemporaries as irrelevant fossils of physics who were stuck in their respective ruts. Farmelo tells us how deeply Dirac’s morale was affected by these developments. For me, it also underscores the inevitable trap of both men consistently applying trusted methodologies and not being swayed by the latest fashions in physics: the deeper the questions, the shallower the progress. In chapter twenty-one, Dirac observes perspicaciously: In the early days of developing quantum mechanics, a second-rate physicist could do first-rate work, whereas it has since become difficult for a first-rate physicist to do second-rate work. Perhaps surprisingly, given the title, a lot of inspiration is contained in Farmelo’s biography. Much of Dirac’s life is filled not only with strangeness, but sadness, and his persona, whether or not it was shaped by autism, inspires a certain amount of stoicism in the face of adversity. That stoicism seems rather appropriate for these economic times. We are also reminded that nothing is necessarily a shoe-in, even for the famous. By the end of this extensive biography, I found significant solace in the strangeness. Neil J. Gunther, M.Sc., Ph.D., SMACM, SMIEEE, is both a computer scientist and a theoretical physicist at Performance Dynamics—the nexus being information. He received the A. A. Michelson Award in 2008.